The new owner of a largely empty Fife shopping centre says they are aiming to help make it financially viable by signing up well-known retail chains. 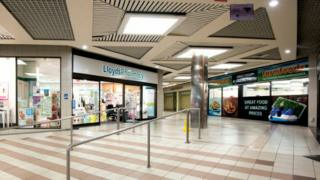 Kirkcaldy's Postings centre was put up for auction with a £1 reserve price but was eventually bought for £310,000 by Yorkshire-based Evergold Properties. It was put up for sale after suffering the effects of the high street downturn as more people shop online. Marks & Spencer also pulled out of the town after 80 years in Kirkcaldy. Elsewhere, companies like Hammerson and Intu, which run major shopping centres in Scotland and across Europe, have also seen profits hit, amid predictions of an industry crisis. But Evergold's Tahir Ali said of the now re-branded Kirkcaldy Centre: "I'm actually very, very blown away at the amount of positive interest that we've had." He told BBC Radio's Good Morning Scotland programme: "It's a very clean shopping centre. I was surprised because when I saw the price and I was heading over to have a look at it, I really did think it would be quite dilapidated and in a bad state. "But it's actually quite the opposite." The 80,620 sq ft centre opened in 1981 and cost £4.25m to build. But it was put up for sale by pension fund Columbia Threadneedle when 14 of its 21 shops became vacant because the running costs were higher than the income being generated. Current tenants include Farmfoods and Lloyds Pharmacy. Mr Ali said: "The first step for me was to engage with them and reassure them of what we're doing." He said it was "definitely the goal" to get more well-known retailers in, adding: "Other than just going out to the national chains, I think it's really important to work with some of the local independent operators as well. "We've already had some good positive dialogue within the first couple of weeks, which is encouraging." Mr Ali said 15,000 people were still walking through the centre every week and that many units qualified for the business rates relief scheme. Evergold has also said it is in "advanced discussions" to find a business to move into the centre's large unit, formerly occupied by Tesco.